What Are Open-ended and Evergreen Funds? Unlike traditional closed-ended investment funds, an open-ended structure has no termination date and capital can be raised, repaid, or transferred on an ongoing basis. The name open-ended fund, evergreen fund, or permanent capital vehicle is liberally used to describe a fund with no end-date. The only core distinction is that evergreen funds are permitted to recycle capital after an exit while open-ended funds distribute it to investors. The core advantage of such funds are that they have more flexibility. Without an end date and with the ability to raise more capital, they can truly focus on long-term capital appreciation for investors. In venture capital, there are very few disclosed examples of such funds—they number around the 200 mark. The majority are in USA and the UK and investing in software. The TVPI returns of these funds are largely in line with traditional closed-ended VC funds, the core distinction being that their RVPI and DPI is respectively higher and lower than the broad VC benchmark. How Are These Funds Different from “Traditional” Funds? When fundraising an open-ended fund, it’s important to have a need for raising one and then marry this with the needs of investors. Some investors, such as corporates and endowments, have a need to lock up capital long term. The budget of an open-ended fund is agreed upon periodically with the investors, as opposed to a percentage of AUM model. It is important to plan evergreen fund investing and fundraising in advance, leaving dry powder for follow-ons and opportunistic plays. In open-ended funds because realized returns are distributed to investors, an exit will likely correspond with another fundraise. Valuing the portfolio is one of the most important aspects of evergreen funds, the NAV serves as a determination of performance and fairly prices the units for current investors to exit, or for new investors to enter. Distributions follow the standard waterfall approach, but one core difference is that open-ended funds tend to return the hurdle rate before principal. This is an investor-friendly approach that ensures investors are truly rewarded for the time value of money. What Is Some Advice from Someone Who Has Raised and Operated an Open-ended VC Fund? Rodrigo Sanchez Servitje is a GP at B37 Ventures. He has been running an open-ended venture capital fund for over five years. In terms of having to have a strong reason to raise an open-ended fund, the thesis of B37 Ventures is to link corporates with startups via investment to bring mutually beneficial opportunities for innovation learning and business development connections. The NAV and valuation of the fund is always a top topic for discussion with investors. He advises that you deploy a process that is transparent, fair, and consistent. Whenever questioned about the fund’s different approach, he focuses on the positives that it brings—flexibility and the ability to connect portfolio companies with business development opportunities. He sees the potential for the secondaries market to evolve in the future, offering open-ended VC LPs more liquidity options outside of fund distribution events. Earlier in 2018, through Toptal, I worked with Rodrigo Sanchez Servitje from B37 Ventures on a project related to its open-ended VC fund. Such funds are still a relatively unknown and misunderstood type of funding vehicle, with a dearth of “in the trenches” information out there about how they operate. With this article, I am looking to correct that. As someone who has raised and operated an open-ended VC fund, throughout the piece, I will refer to Rodrigo for invaluable insight regarding B37 Ventures’ experiences. In venture capital fundraising, as the adage goes, “if it ain’t broke, don’t fix it.” For years, funds have toed this line by raising capital through closed-ended vehicles. This refers to a management company raising a set amount from external investors via a limited partnership legal structure for a fixed number of years (typically ten). After this process, the doors close, money is put to work and, at the end date, the fund is wound up and repaid. Despite investing in disruptive and innovative industries, the landscape of VC fund structures has largely remained unchanged. The most obvious alternative would be the inverse of a closed-ended fund: an open-ended one. In these such funds, capital is invested directly into an LLC on an ongoing basis with no termination date. It is essentially investing preferred equity into a company: Investors buy units of a fund with a yield attached (the hurdle rate) and they can buy more, or sell, whenever they wish. This type of fund is also liberally referred to as a permanent capital vehicle or evergreen fund. The ethos between the names is largely the same, in that it’s referring to structures with no end date or fixed capital quotas. A core distinction is that an evergreen fund can recycle returned capital while open-ended funds (like B37 Ventures) distribute to investors. Alignment: Managers can focus on capital appreciation without time barriers. Also meshes well with entrepreneurs looking to grow their business sustainably. Cleaner: Fund investors can take a long-term view without constantly needing to invest. Flexibility: More freedom to change an investment thesis and hold other types of investment. Transparency: One budget and set of management fees, instead of layers of costs that build up. “Having an open-ended structure was the one that most aligned all the parties. Our target investors are corporations that have between $500 million and $20 billion of sales—for them to invest in VC, they’re not primarily interested in financial returns. They want strategic returns. Illiquidity: For investors in open-ended VC funds, the promise of liquidity may be a moot point. Startups generally don’t pay out dividends and secondary fund markets are thin. Lumpy cash flows: Big exits at unexpected times can clean out a waterfall in one go. Valuation: The NAV of the fund must be absolutely transparent and consistent. Perception: Startups and co-investors may not have familiarity with how such funds work. How Many Evergreen Venture Capital Funds Exist? The number of evergreen VC funds is estimated to be around the 200 mark, with approximately 100 coming into existence inside the past 20 years (Pitchbook). To put into context how niche these structures are in VC, there are over 10,000 investors globally classed as “Venture Capital” funds. As a caveat to this, the “real” number of evergreens is likely higher than 200, because this manner of investing is widespread amongst angels, family offices, and corporate venture units. Oftentimes, these funds sit under the umbrella of an organization and are not disclosed through usual data channels. 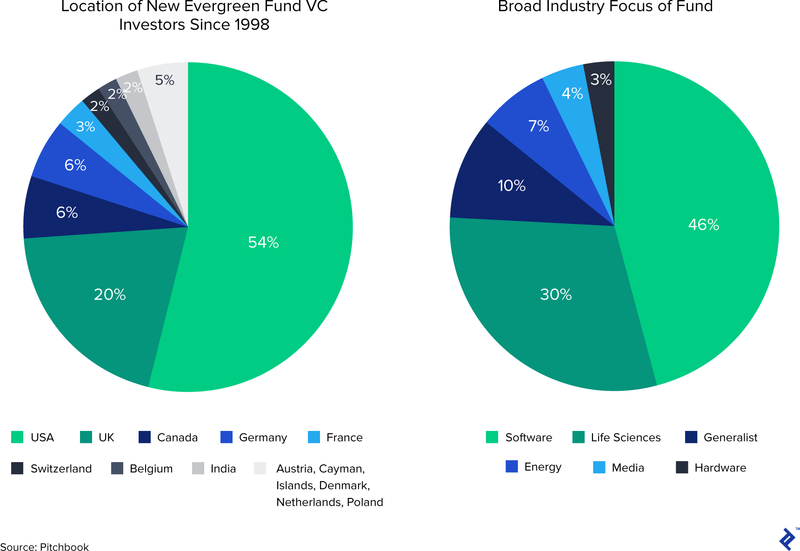 Of the 92 evergreen VC managers that initiated since 1998, almost three quarters are based in the USA or UK. This is unsurprising, given that both countries have the most fluid capital markets and are seen as central hubs of entrepreneurship within their territories. Again, no surprises that software is the most popular investment vertical for evergreen VC funds, but what is interesting is the popularity of life sciences. This would appear to be a sector that complements well with an evergreen mentality, due to the long testing and approval phases undertaken by new technologies in the industry. 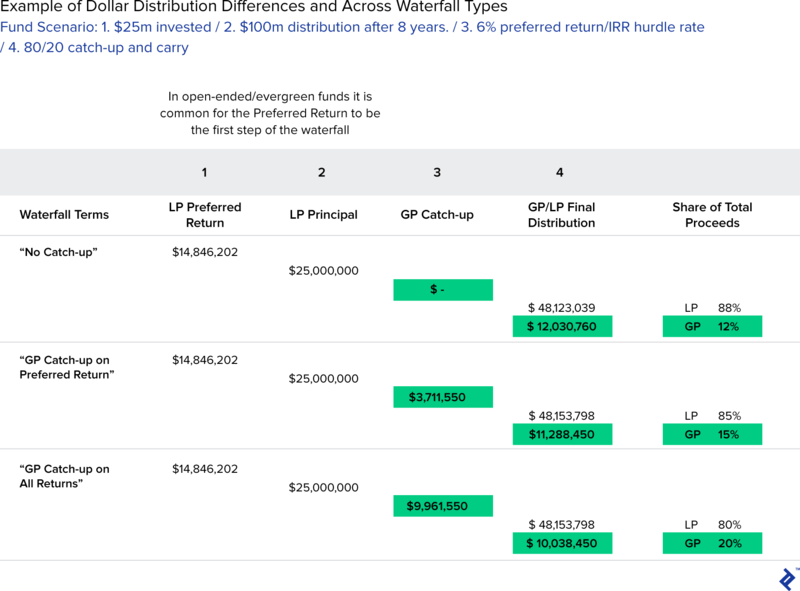 How Do Returns Compare to Closed-ended Funds? 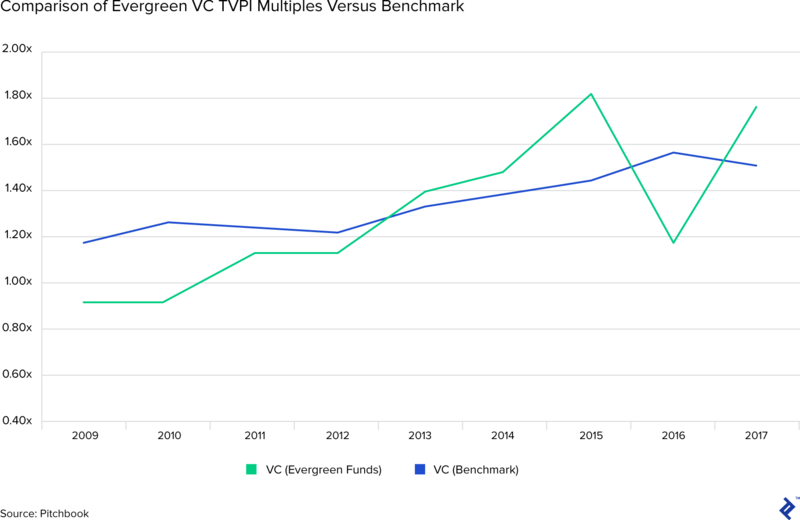 When comparing evergreen fund performance to an overall VC benchmark (encompassing all types of funds), returns are largely similar from a “Total value to paid in” (TVPI) perspective. As we know, VC returns have irregular returns distributions and as such, a benchmark does not paint a complete picture. Nevertheless, despite evergreens and closed-ended funds having different mechanics, it does not seem to affect their TVPI returns (Pitchbook). Where this returns analysis gets interesting is when TVPI is deconstructed into its components of “Residual value to paid in” (RVPI) and “Distributed to paid in” (DPI). 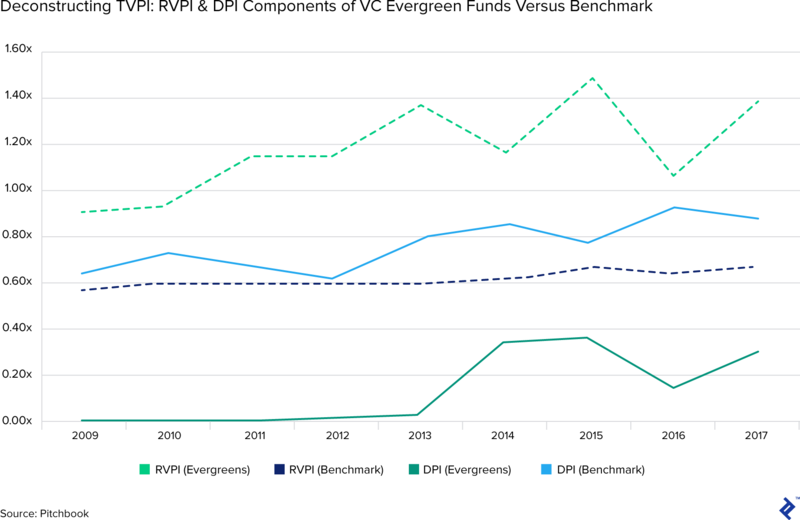 Wherein the characteristics of evergreens really become apparent, they have low DPI but high RVPI compared to more closely aligned metrics for the VC benchmark. This demonstrates a validation of the long-term approach that evergreen funds take, showing that such a tactic can be more value accretive (RVPI), but at the sacrifice of quicker distributions (DPI). There must be a compelling reason to raise an evergreen or open-ended fund beyond just because it’s something different. It is vital to align it with your own motivations and also to ensure that it adds value to investors and the businesses that you plan to invest in. Have a strong belief in “sum is greater than the parts” investing and wish to leverage a position as a timing-agnostic investor to foster this in a portfolio. Have a view that an investment philosophy can be distilled into an inter-generational firm that can continue on without you one day. Are in an emerging market country where exit waits are longer. “Our target investors are large corporates and family offices that don’t need to return capital quickly. With evergreen funds having no end date and with the flexibility of being able to top them up with more capital, planning investment timescales can seem endless. As with any fund, retaining dry powder for follow-ons and opportunistic plays is crucial, but exits add another dimension. A common misconception regarding exits in open-ended funds is that they can recycle capital. That is in theory possible, hence the term evergreen, but it can be counterintuitive towards aligning the interests of the manager with the LPs. If there are no distributions, there are no chances to realize profits. Clawback provisions are not common in open-ended funds and so, recycling capital can make it hard to retain quality investment staff, who will be perpetually waiting for performance-related compensation. Instead, the fund manager must look to tie up exits with future fundraising, almost as if LPs are in cohorts, bookended between exits. An exit represents a soft reset where capital can be returned and potentially reinvested by exited investors. This was a focus of the work that I did with B37, to ensure that fundraising is planned for optimal timing and with the best interests of current investors in mind. 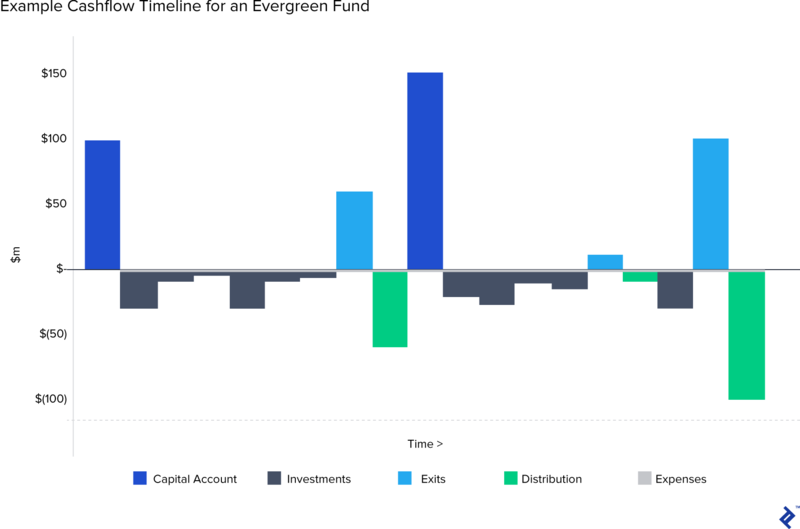 To visualize the cash flows of an evergreen fund, the chart below plots an example of the timing of cash flows by activity. NAV is important because it equalizes future fundraising to ensure that current investors are treated fairly. Because distributions between investors are on a parri passu basis for all returns, it is possible for the last investor in to reap the rewards of an investment made from the first capital in. If the portfolio is loaded with potential winners, the NAV will reflect this and new investors will pay the price. From a waterfall perspective, if preferred returns are paid out first, it may take longer for the waterfall to cascade down in its entirety. Depending on the catch-up terms chosen, the end results can vary in terms of the proportionate split of total profits. Unlike evergreen private equity or real estate funds, there are rarely interim cash flows in venture capital between investment and exit. This can present distribution scenarios where there is nothing for a long period, followed by a huge exit that can instantly wash a waterfall down to its final step. Large realized exits are, of course, cause for celebration, but the GP must be cognizant to their timings because the clearing of the cap table and profit taking may then require a recapitalization of the fund. In an open-ended fund, there is the potential to grow an intergenerational investment business. Many closed-ended funds are inherently tied to the star manager, who takes LPs with them when they leave, or the management company shuts down when they retire. Because of the flexibility that an evergreen fund structure affords, there can be the temptation to experiment with bolt-on businesses, like accelerators or company builders. Rodrigo errs toward caution in pursuing such endeavors because of the potential for conflicts of interest with existing portfolio investments. What makes evergreen funds a topical discussion for this age is the emergence of token-based investment funds attached to blockchains, because they are in a sense, evergreen investment vehicles. Proponents of these funds say that investors have more liquidity options through the token being listed on crypto exchanges and investors being free to make markets there. Yet, as with any asset, OTC, or exchange listed, there is only liquidity if there are pools of willing buyers and sellers. I hope that this article can provide some insight into this fascinating niche of investment vehicles. As the analysis and input from Rodrigo shows, open-ended and evergreen funds may not be everything for everyone, but for some, it could be a flexible and rewarding way of putting money to work. What are open- and closed-ended funds? Open and closed reflects whether a fund has a defined end date and fixed level of assets under management. Closed-ended funds raise a set amount and then are legally required to terminate at a set future date. Open-ended funds can continue as an ongoing investment vehicle and raise or redeem capital. What is an evergreen fund?